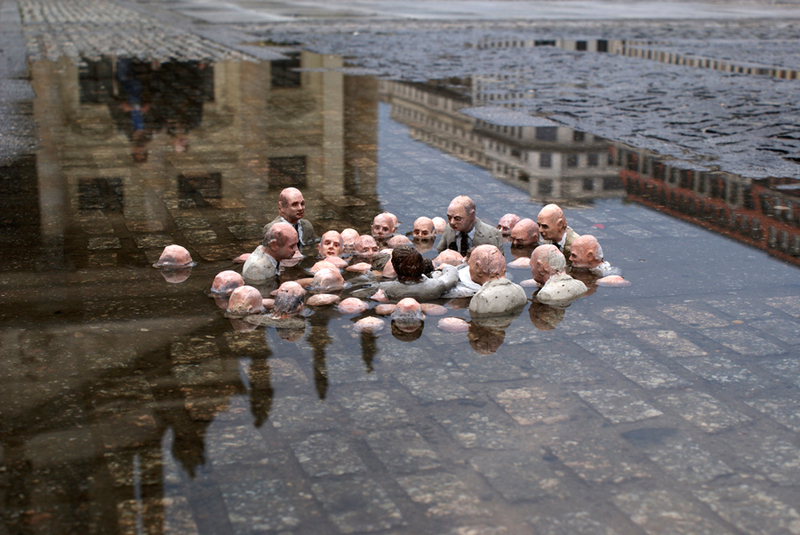 Waiting for Climate Change an exhibit by Isaac Cordal, Berlin, Germany. 2011. Today, the Administration released the Third U.S. National Climate Assessment, the most authoritative and comprehensive source of scientific information to date about climate-change impacts across all U.S. regions and on critical sectors of the economy. The report, a key deliverable of President Obama’s Climate Action Plan, confirms that climate change is not a distant threat — it’s affecting us now. Based on four years of work by hundreds of experts from government, academia, corporations, and public-interest organizations, the Assessment confirms abundant data and examples that climate change isn’t some distant threat — it’s affecting us now. Not only are the planet and the nation warming on average, but a number of types of extreme weather events linked to climate change have become more frequent or intense in many regions, including heat waves, droughts, heavy downpours, floods, and some kinds of destructive storms. The good news is that there are sensible steps that we can take to protect this country and the planet. Those steps include, importantly, the three sets of actions making up the Climate Action Plan that President Obama announced last June: cutting carbon pollution in America; increasing preparedness for and resilience to the changes in climate that already are ongoing; and leading the international response to the climate change challenge.